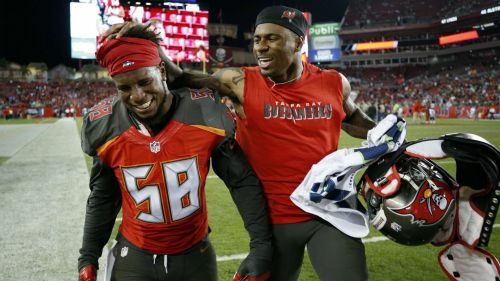 Kwon Alexander has agreed to a four-year, $54million deal with the San Francisco 49ers, according to widespread reports. The Tampa Bay Buccaneers linebacker tore his ACL in Week 7 last season, but that did not impact his market value, and he is poised to become a 49er at the start of the new league year on Wednesday. A fourth-round pick by Tampa Bay in 2015, Alexander has been a starter throughout his career but has had trouble staying on the field at times. He was suspended for the final four games of his rookie season after violating the NFL's performance-enhancing substances policy. Alexander then missed four weeks early in 2017 with a hamstring issue, but still made the Pro Bowl as he finished with 97 combined tackles and three interceptions. The 24-year-old recorded 45 tackles in six games in 2018 before his season-ending knee injury. He essentially becomes San Francisco's replacement for Reuben Foster, the inside linebacker who was released in November after being arrested and charged in a domestic violence incident. Prosecutors dropped the charges against Foster in January.